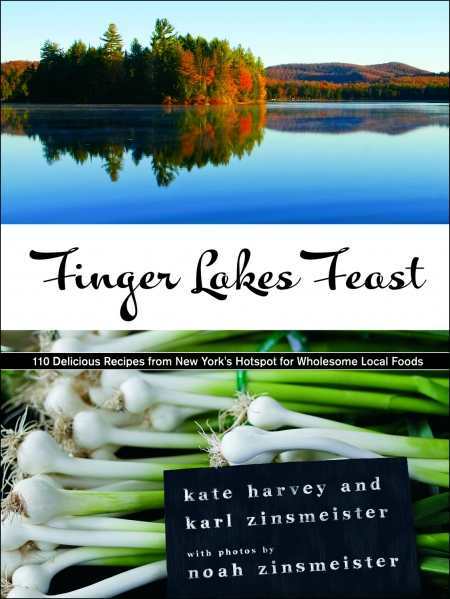 These more than one hundred recipes from Kate Harvey and her father, Karl Zinsmeister (along with photos by son/brother, Noah), focus on crops from the Finger Lakes region in upstate New York. The family shows its appreciation for the local culture by consulting with two dozen chefs, as well as farmers, residents, and vendors, and delivering a bountiful collaboration that’s in keeping with the book’s community-oriented theme. Presented in simple steps, most recipes require only a handful of easily found ingredients. While most can be bought in a grocery store, the authors recommend seeking out local butchers and farmstands to get the most delicious offerings. Featured are a wide range of breakfast dishes, salads and sides, soups and appetizers, main dishes, and sweets that will appeal to all palates: granola, maple corn pudding, mushroom cauliflower soup, mojito bars, and little ricotta cheesecakes. Some staples are surprising: a fondue uses crabmeat, cheese, and Cajun seasoning; and a pear bread is a twist on the traditional banana bread. Many of the main dishes have been adapted from restaurants (black beans and coconut rice with mango salsa, from Moosewood Restaurant in Ithaca, and pork tenderloin with peach salsa, from Ports Cafe in Geneva, New York). Harvey and Zinsmeister write in a friendly tone as they offer suggestions (don’t over-stir the orange apricot muffin mix; make the cider-vinegar chili a day ahead to further develop the flavors) and discuss their trial-and-error process. Their candor makes their prodding to try some of the more adventurous combinations, like the chocolate sauerkraut cake, more convincing. Adding to the warm and casual tone are recipes from family and friends—such as three-sisters corn soup, Kathy’s bran muffins, and Grandma Z’s date nut bread—or from local notables, like the Cornell chicken, created by an animal science professor who uses apple cider vinegar to marinate the bird before barbecuing. Along with the recipes are a history of the Finger Lakes region, a list of area businesses that use local ingredients, an instructional description of which apple varieties are best for specific recipes, and a discussion of developments in agriculture (such as hydroponics) at Cornell University. More than a cookbook using foods found in the Finger Lakes region, this is an informative and useful guide about adopting a healthy lifestyle that supports local farmers and businesses.